Guardians of the Galaxy 11 was cover dated April 1991 and was on sale February 1991, sharing the spinner racks with Action Comics #663, Avengers #391, The Demon #10, Excalibur #36, Justice Society of America #1 and New Mutants 100. 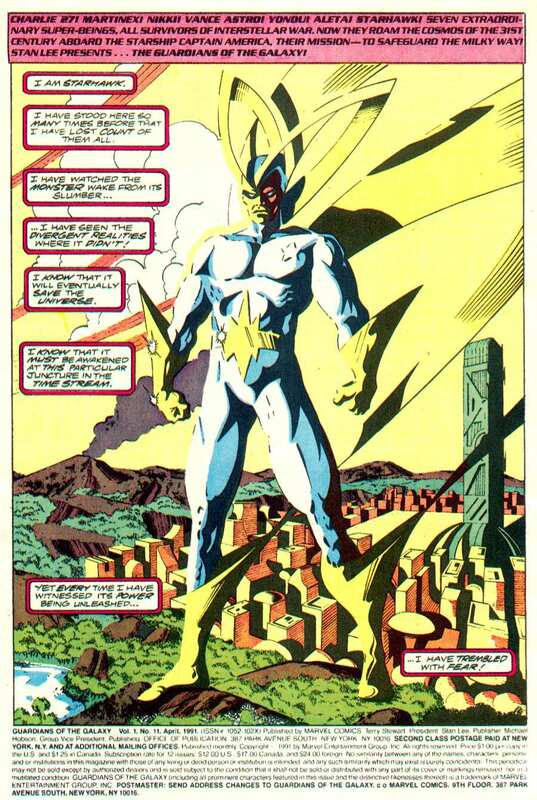 Once and Future Phoenix was written and pencilled by Jim Valentino and once again Steve Montano did the inks. 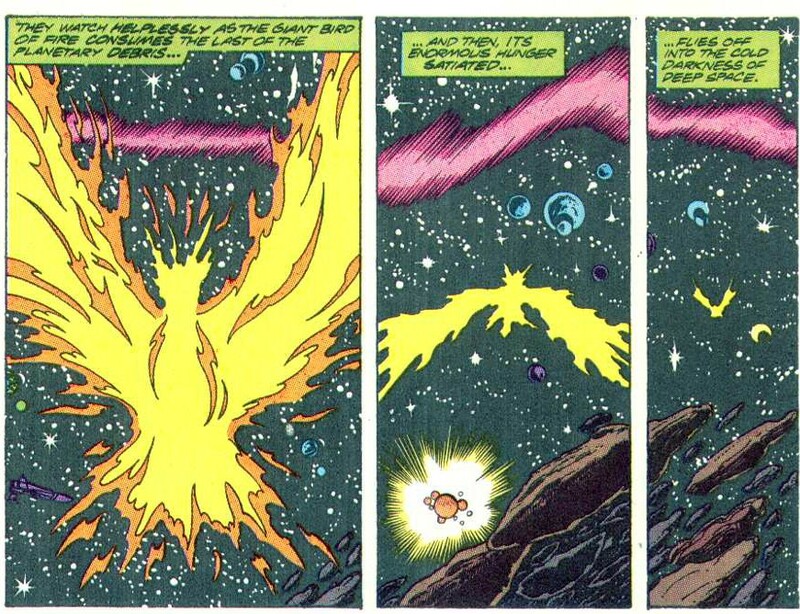 The Story picks up seconds after the last one ended, with Giraud of Haven being used as host to unleash the Phoenix. The Phoenix devours the volcano which housed him and Starhawk watches, remembering how this has all happened before, but it still quite afraid. Giraud revels in his new power as Charlie-27 tries to stand up after being floored by the battle sphere in the last issue. 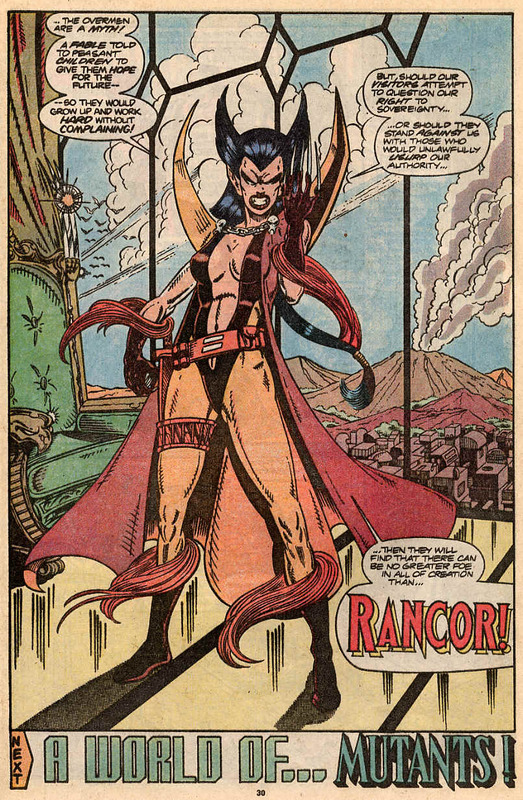 Phoenix decides to end Rancor’s tyranny by ending her life and moves towards to tower, despite Starhawk’s words of caution. The battle sphere turns on the Phoenix, who destroys it with a wave of his hand forcing Side-Step to teleport away. She opens a portal to get Rhodney and Batwing away as well, but before that can happen Charlie manages to get a shot off and Rhodney falls. There’s the a scene change and we are on Force’s ship. Brahl is walking through walls trying to sneak a pervy look at Broadside, but instead of her being in the shower, she’s on her bed fantasising about Charlie-27, who’s image is on her holo-tv sort of thing. They go to the bridge, fuming at eachother and Interface comments that an object too small to be anything but a person and too hot to be anything but on fire is heading there way. Back on Haven, the attacking Guardians Vance & Nikki, face Rancor, Blockade & Shaddo, From behind Yondu, Aleta and Martinex as well as Replica attack with Yondu firing an arrow into Rancor’s leg. Seeing that Blockade can’t be stopped, Nikki instead fires her wristguns at his eyes, blinding him. 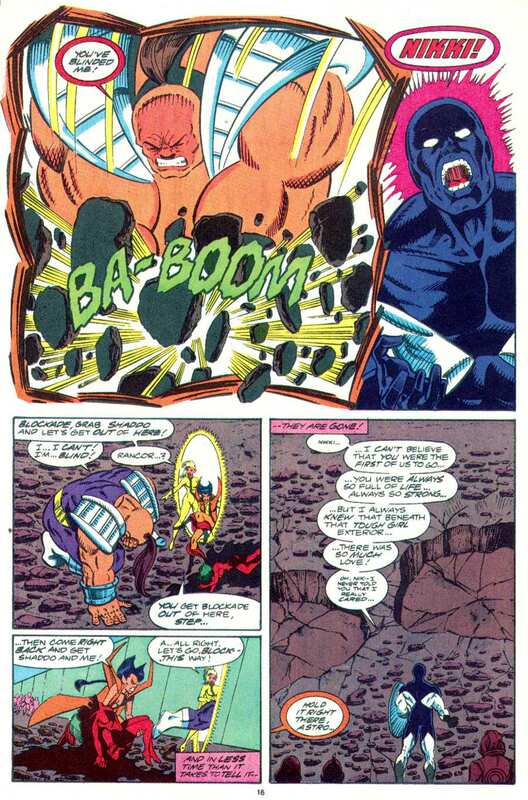 He smashes her into the ground in front of a distraught Vance and then retreats with Rancor and the rest of the surviving mutants via Side-Step’s portal. Aleta then reveals that Nikki was always protected and is unharmed. Charlie runs in and everyone’s happy to be together again… and then the Phoenix shows up. As this happens, earthquakes are ripping through the planet as Rancor de-activates the seismic restraints, she is reminded by Mindscan that this will destroy the planet, Rancor could care less. 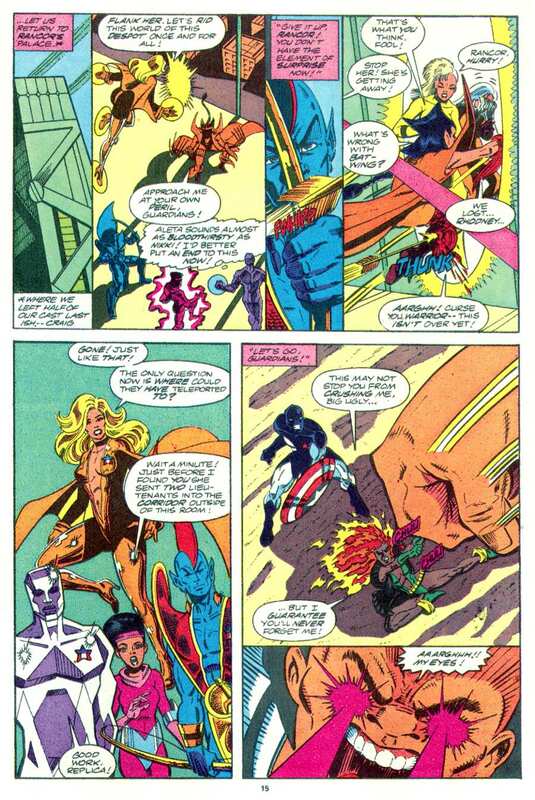 Starhawk arrives and hits everyone’s g-stars and teleports them to the Captain America II against their will. 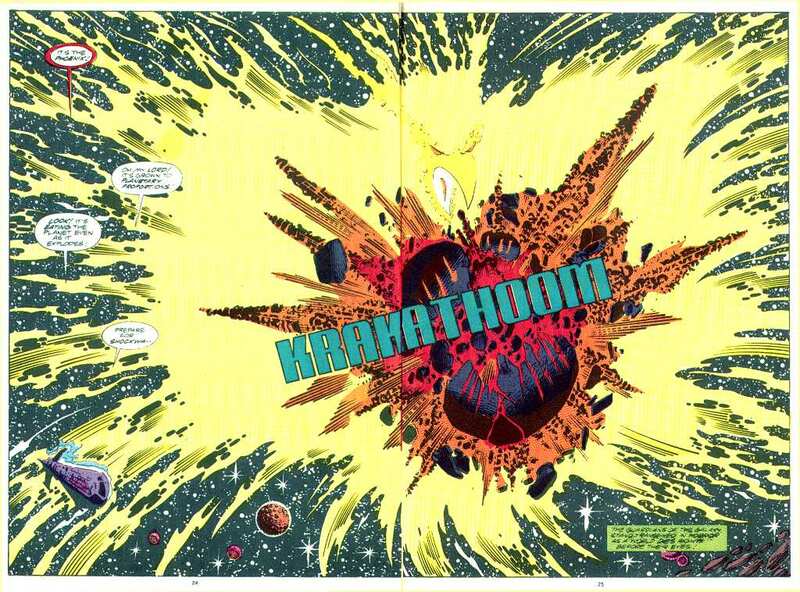 Before the ship can depart, the planet explodes, seemingly killing everyone on the surface, even Starhawk. Charlie points out that the ship can’t leave, since all the power is being used by the transporters. The planet’s remains are quickly devoured by the Phoenix, who then departs. 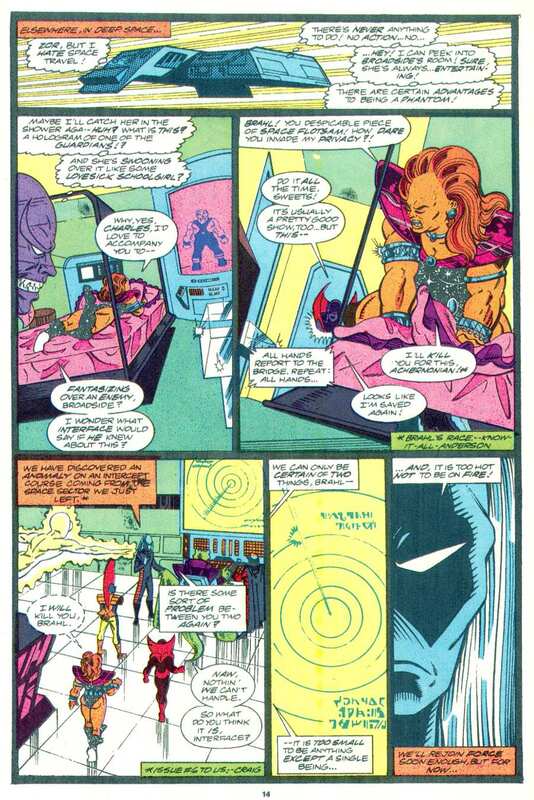 Starhawk signals them from Mainframe’s world, telling the team that the inhabitants of Haven are safe, teleported to safety at the last second and the Phoenix has agreed to be placed inside psionic dampeners to keep in under control. 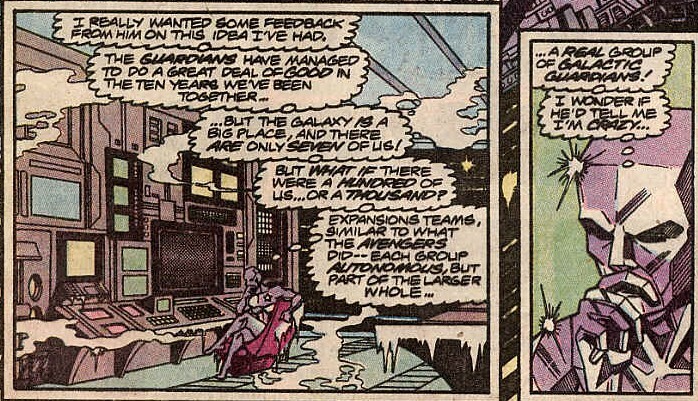 No one’s pleased that once again Starhawk has played chess with the Guardians of the Galaxy, but are thrilled with the result that while the world of the mutants is gone, the people are safe and will be cared for by Mainframe, who is looking forward to the company after many years alone. 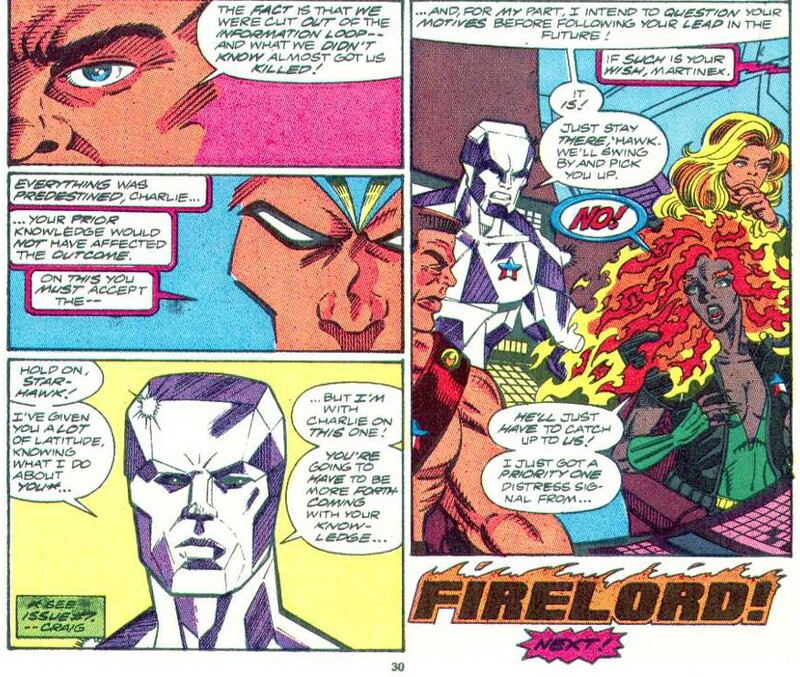 Just as they Guardians of the Galaxy brief a sigh of relief, Nikki tells them that Firelord has sent a distress signal. Notes: This is a fast paced conclusion and as a result almost feels a little rushed. How tough is Charlie-27, all those hits he took in #10 and not only is he still alive while the entire crowd seemed killed, but he can get up and fire that cannon before running to join the rest of the team. Once again, Starhawk acts like the team works for him and does his own thing, without telling anyone what’s going on. 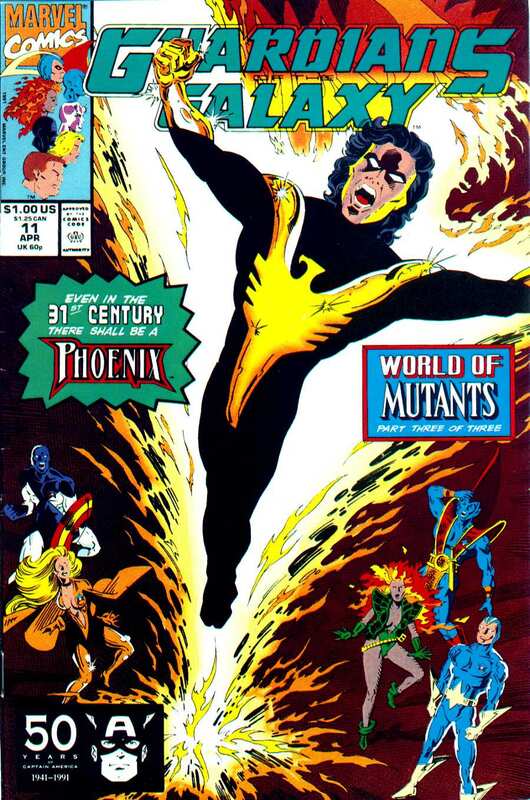 The Phoenix is a character/force of nature long familiar to the X-Men, with it’s arrival always seen as a bad sign, it was a little deus ex machine, but worked for the purposes of the story and the costume design was excellent. The Force subplot moves their particular story along and Broadside’s infatuation with Charlie-27 is a nice little bit of colour to what could be a very bland character, much like the rest of Force has been. Overall a satisfying issue ending the Guardians of the Galaxy’s original mission. This is also a bit of a milestone issue for me. This is the last back issue, from this point on, I picked the comic up off the rack and read it until it’s cancellation at issue 62. Next ish: Firelord returns and he isn’t the only one. Guardians of the Galaxy 10 was cover dated March 1991 and was on sale January 1991, sharing the spinner racks with Angel & Ape #1, Captain America #383, Challengers of the Unknown #1, Darkhawk #1, Superman # 53 and Uncanny X-Men #274. Tell them the Overmen are Here was written, drawn and inked by the usual suspects and opens with a bit of a recap of the last issues events. 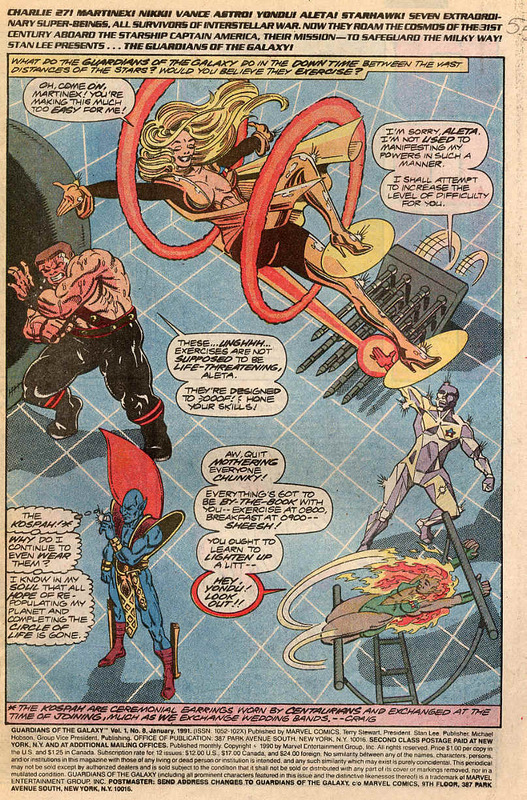 As the call for surrender ends, the girl in pink from the last issue appears before Giraud. He identifies her as Replica. She wears a pink all in one costume with a sort of ankh looking pendant. Charlie-27 tells Giraud to get the populace to the town square and the urge them on he announces that the prophesied Overmen are here. Word spreads and in a lot of places, the same ankh-like symbol is seen. 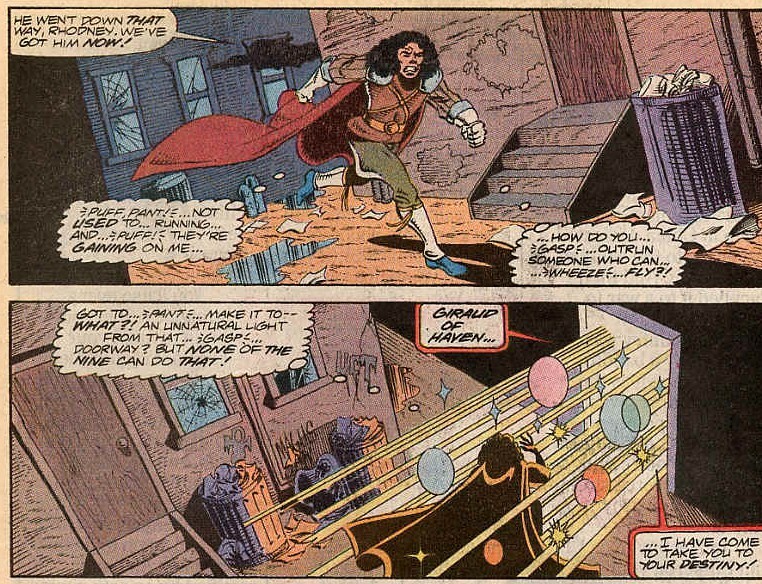 It is also the same sign used in the massacre, whose aftermath was seen by Starhawk several issues ago. 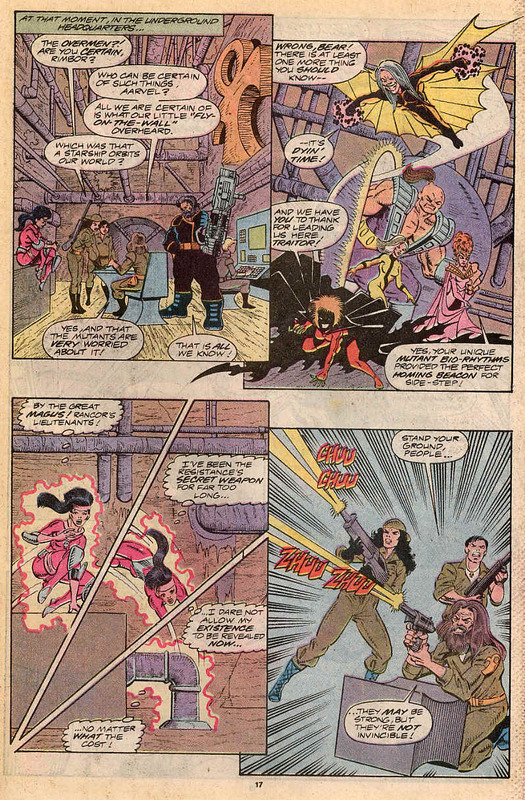 Around here there is a scene change, with Starhawk being back on Mainframe’s world, making preparations to contain something that Starhawk means to unleash, the term psionic dampeners are used. 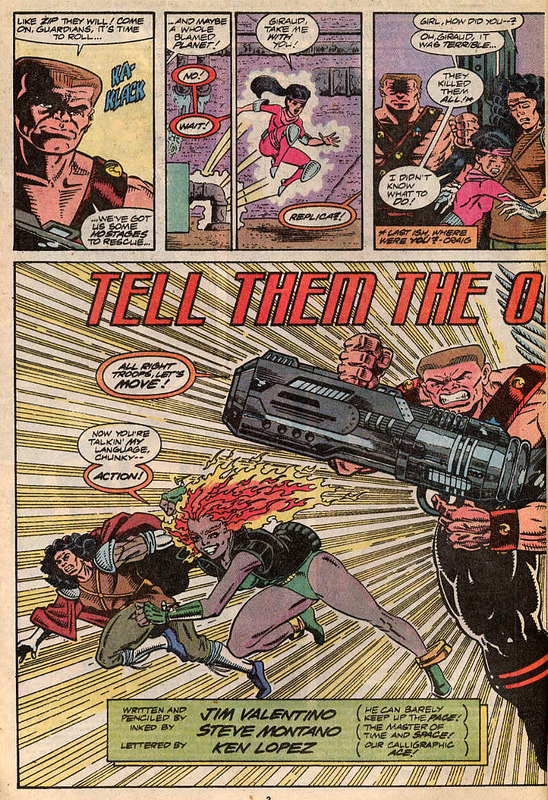 The mutants notice the disturbance building in the square and their first response it to deploy a battle sphere, which is a flying ball with guns coming out, to start massacring the crowd. Using Bear’s gun from previous issue, Charlie fires back. The gun’s recoil rather unceremoniously, knocks him on his bum. Blaster and Batwing exit the ship and also attack the crowd. 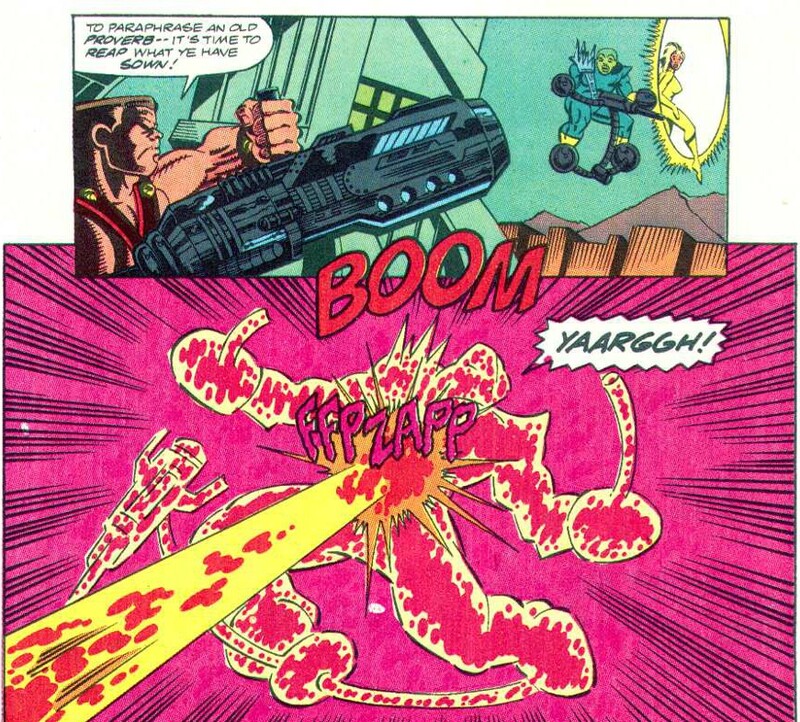 Giraud fires on Blaster, killing him. Batwing is horrified, giving Charlie the chance to anchor himself and fire again. The fire drawn towards Charlie-27, the rest of the team splits even further. Replica changes into a bug and flies off to free the captured Guardians, Starhawk takes Giraud somewhere else entirely and Vance takes Nikki to storm Rancor’s tower. 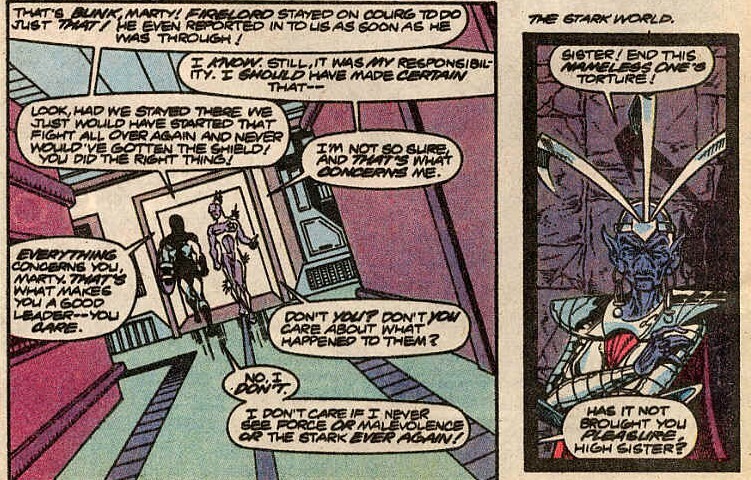 The scene shifts to a Stark world where the High Sister greets TSFKAT (The Stark Formerly Known As Taserface) and declares him one of the most powerful of the Stark and owner of a new name ‘Overkill’. His new gold and red armour is revealed and a reckoning is promised. Vance leads the humans almost uncontested into the tower, while Replica frees Aleta, Yondu and Martinex, where we learn that she is only 13. Only for all those in the tower for face Rancor. 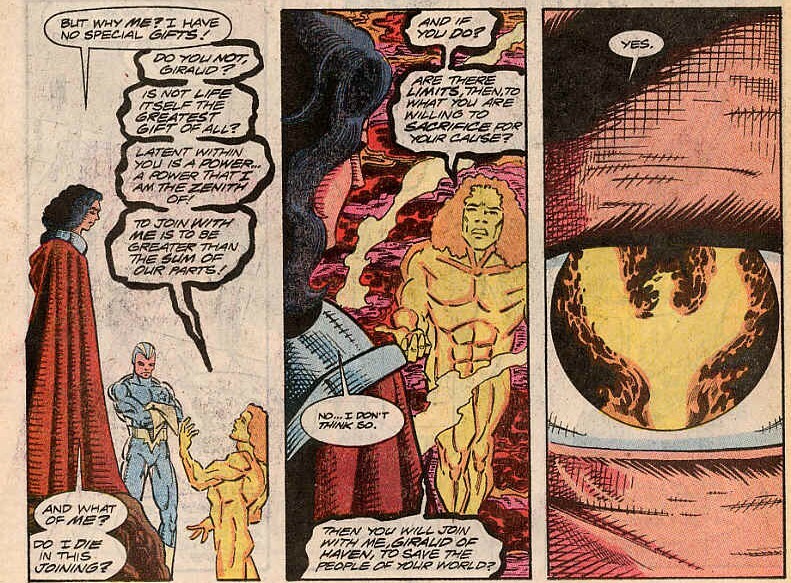 The scene shifts to the Volcano again, this time Starhawk is only the observer and Giraud is talking to the disembodied voice, now wearing a glowing form much like Giraud’s. The glowing figure seems to be asking Giraud to make some kind of sacrifice, or making sure that Giraud knows what he is giving up. 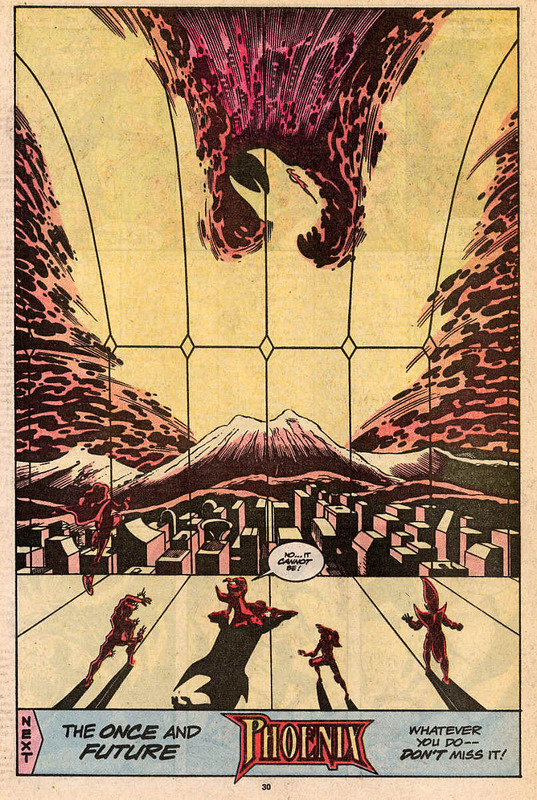 At the tower, Rancor, Shaddo and Blockade are fighting the attacking Guardians and look to be winning, until there is a massive burst of light in the distance and out of her window Rancor can see a familiar shape to many a Marvel fan, a huge bird silhouette composed entirely of flame. The Phoenix has returned. Notes: This is a solid little middle part issue, setting up the rising action, leading to a cliff-hanger before the conclusion. 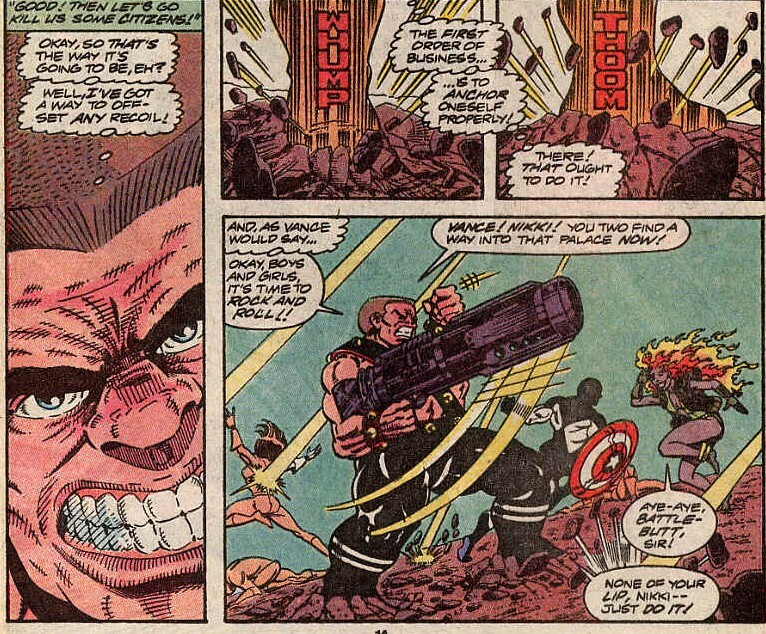 The Stark subplot is moved forward and we’re introduced to Overkill. 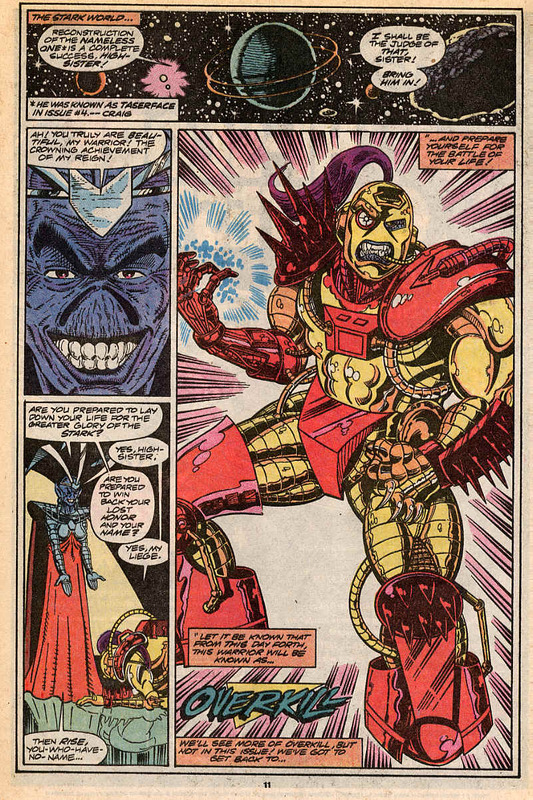 While very 90’s, it’s a lot better than Taserface, I think we can all agree. The ankh-like symbol is becoming more and more noticeable and it looks to have been outlawed on Haven before now. 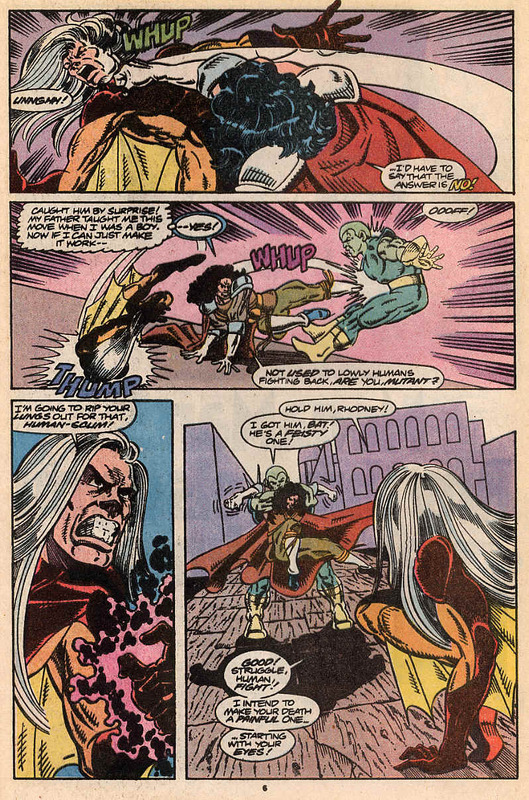 Replica is clearly pointed out to not be a mutant and her very presence seems to upset or offend Nikki. 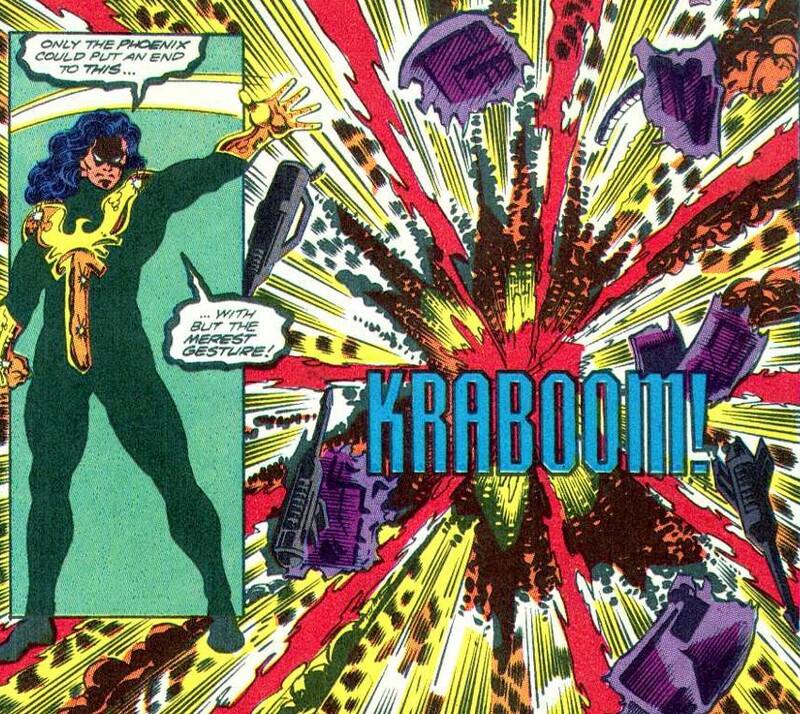 The massacre in the square seems to remind Nikki of watching her people on Mercury killed by the Badoon, a reminder of the harsh upbringing she had. Next ish: The Phoenix has returned, that’s almost never a good sign. Guardians of the Galaxy 9 was cover dated February 1991 and was on sale December 1990 sharing the spinner racks with Action Comics #661, Death’s Head TPB, Legends of the Dark Knight #14, Mighty Mouse #5, New Gods #22 and Sensational She-Hulk #24. Rancor was her Name-O was written and drawn by Jim Valentino and inked by Steve Montano and opens on Haven with the expositional musings of a Haven native called Giraud. Giraud the grandson of one of the first rebels feels resentment towards the ruling Nine and their dominion of their human subjects. He thinks of the Overman (who were mentioned last issue) and hopes for them to come. He is then harassed by Rhodney, a green skinned man with a spikey shoulder-pad and Batwing, a white haired man with as you can imagine Batwings running from his under arms to his calves. Rather than submit to their arbitrary executions, he attacks and flees, before being saved by a voice coming from a shining light, who idenitifies itself as one who knows and I think we know where the scene cuts to next. 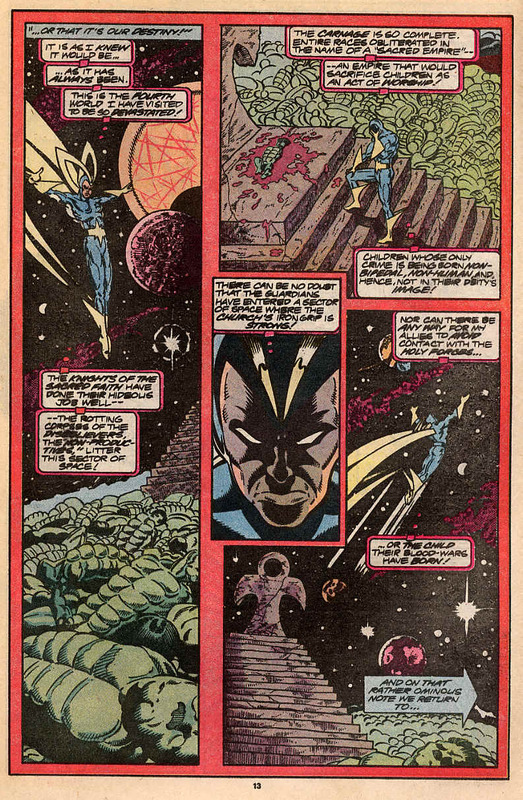 On the Captain America II, the Guardians are looking over Haven, noting the massive geological turmoil. 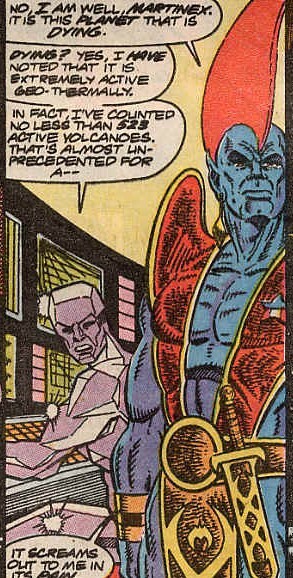 Yondu comments that the planet screaming in pain. 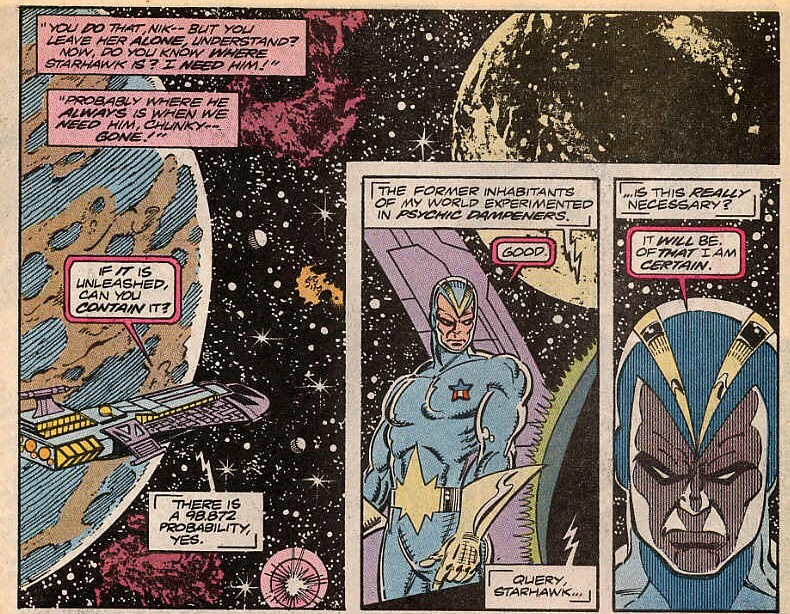 Starhawk arrives with Giraud who gives the Guardians a brief history of the planet. 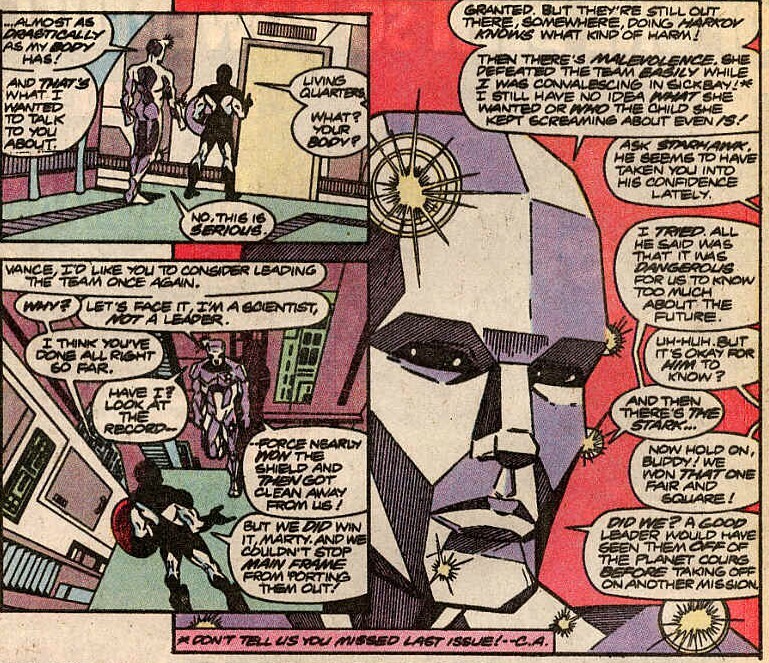 It turns out that Magneto offered to take the mutant population of Earth to another world to escape persecution and death at the hands of sentinels. They stopped on Europa where they faced Apocalypse of all people. 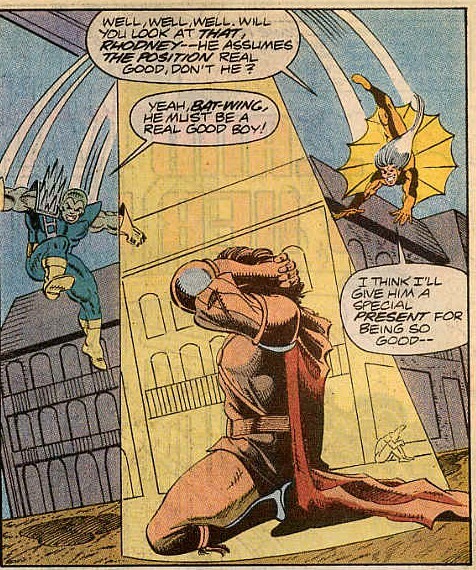 Magneto battled and defeated him at the cost of both of their lives. 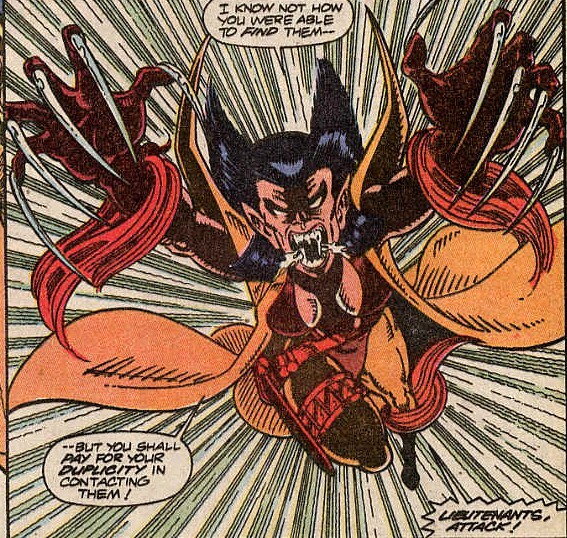 Wolverine of the X-Men took the leadership role and the mutants fled to find Haven, it was a harsh and unforgiving place, but the mutants tamed it and made it home. Wolverine declined to lead, his descendants lacked only his restraint, not his vicious nature or his longevity, either out fighting or out living any opponent and soon taking command of Haven and it’s growing human population. Mutants traits are not always passed on, so a greater and greater portion of those born were only human, making the mutant elite more and more powerful, until the Nine rule with an iron fist. 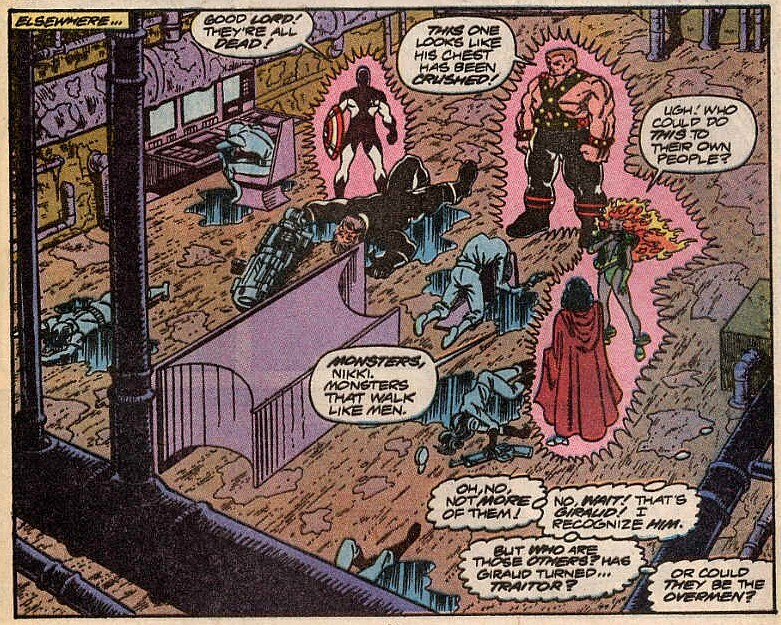 The scene shifts to an underground base and a resistance group, including a mutant known as Bear. They are planning against the Nine, when they burst in, one by one killing the resistance and leaving their bodies where they lay. Only a girl in pink seems to survive by hiding in the wall. After hearing this story, the Guardians agree to help resolve the situation. Starhawk suggests splitting up, Yondu and Aleta are to accompany Martinex to meet with Rancor, the current ruler, whilst Nikki, Charlie-27 and Vance meet with locals to determine the state of the resistance. Starhawk will do whatever he knows he needs to do and the teams depart. The scene shifts to a Stark world where a cyborg scout complains about TSFKAT being reconstructed. The Stark leader scolds him and tells him that the creature will end up far more powerful. Arriving at Rancor’s tower palace, the team are met with an imperious and snarling Rancor who knowing their number immediately asks where the rest are. Diplomatically, Martinex tells her that they are among the local populace, making enquiries there. 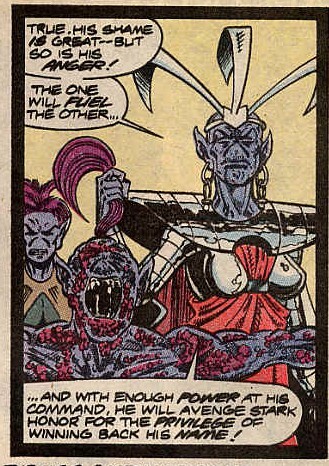 This incenses Rancor who realises that this means the resistance and orders her mutants to attack. There is a fight, which the Guardians lose and then Rancor demands their surrender. Inside a volcano, Starhawk stands above the lava, in conversation with a disembodied voice. The voice tells Starhawk that after half a millennium dormant, it is going to rise and that is all there is to it. Vance, Charlie and Nikki arrive at the resistance base with Giraud, to see the dead bodies all around, hidden from view is a girl from earlier who can either change shape, or cast the illusion of doing so. She sees Giraud and believes that these strangers are the prophesied Overmen. Notes: After over a decade, the Guardians of the Galaxy arrive at the last free colony. The relationship between Vance and Aleta has progressed, but he’s still being very cautious about being public with it all. Aleta, not so inhibited. We’re back to Starhawk just wandering around and adjusting events to being things into line with either what he remembers, or what he wants things to end up being. His bringing Giraud up seems almost arbitrary, but you can already guess it isn’t. 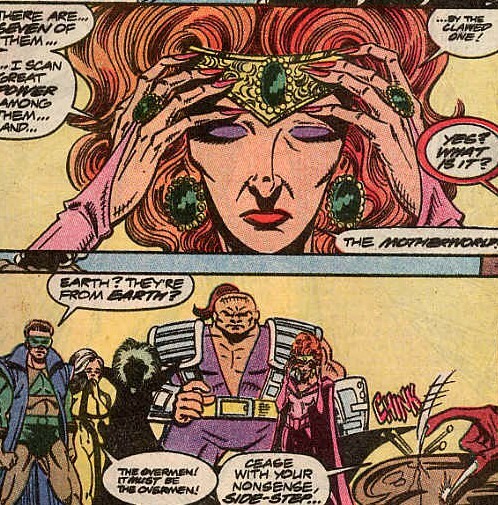 Despite it being a world of mutants, the only ones we meet are: Rancor, a sort of female Sabretooth. 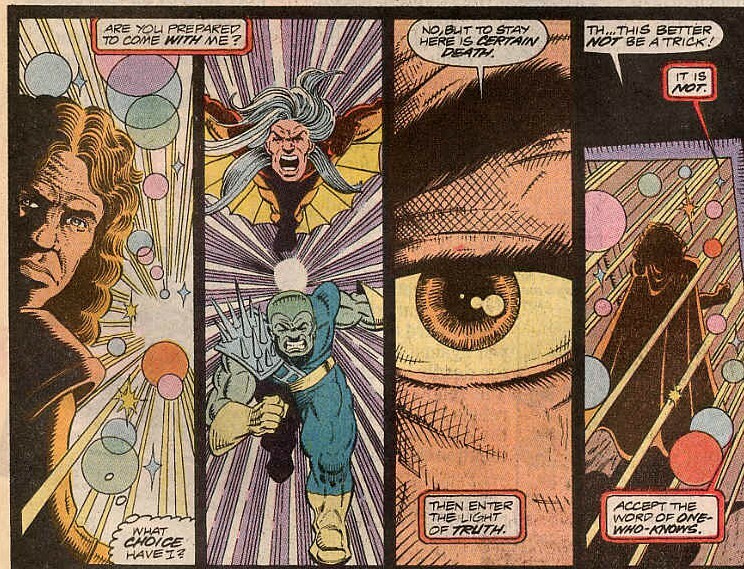 Mind-Scan: A telepath. Side Step: A teleporter, who uses expandable portals, so more can travel with her. Shaddo: With a living cape of darkness. Batwing: We mentioned him before. Rhodney: Ditto. Blaster: A generic energy caster. Blockade: A big guy, who gets bigger and bigger. Bear: Another big guy, with a big gun, who changes sides before being killed. 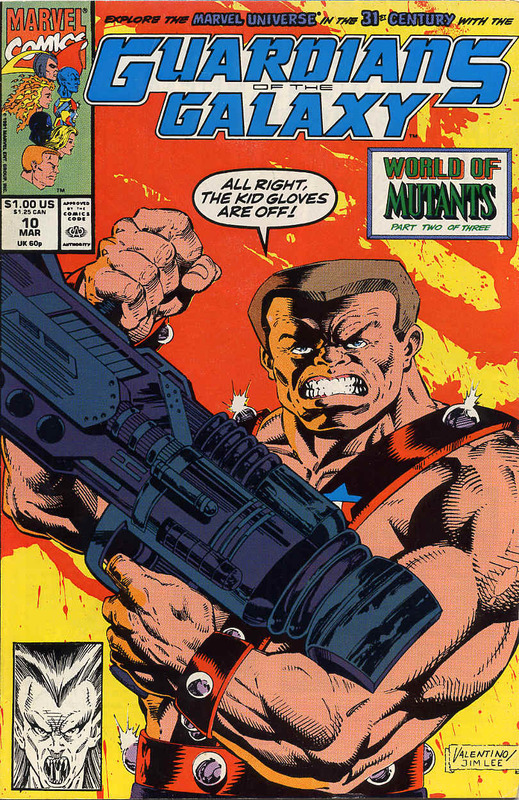 There are mostly quite forgettable and bring very little to the story, but this story did need mutants. The Stark subplot continues, but there’s only an issue or two left before that comes back to the fore. This storyline answers a question that comes up in my head from time to time regarding the X-Titles. 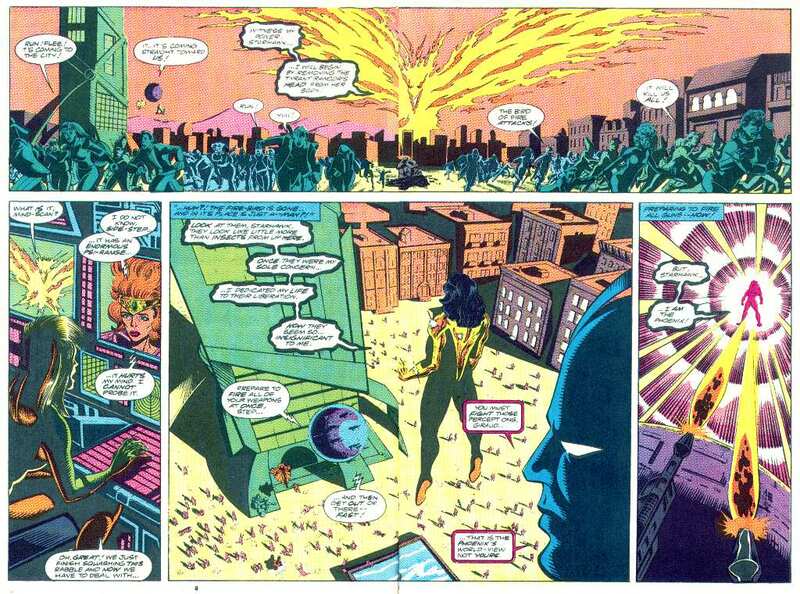 During the days of future past timeline, the X-Men’s focus changes from integration to simple survival. 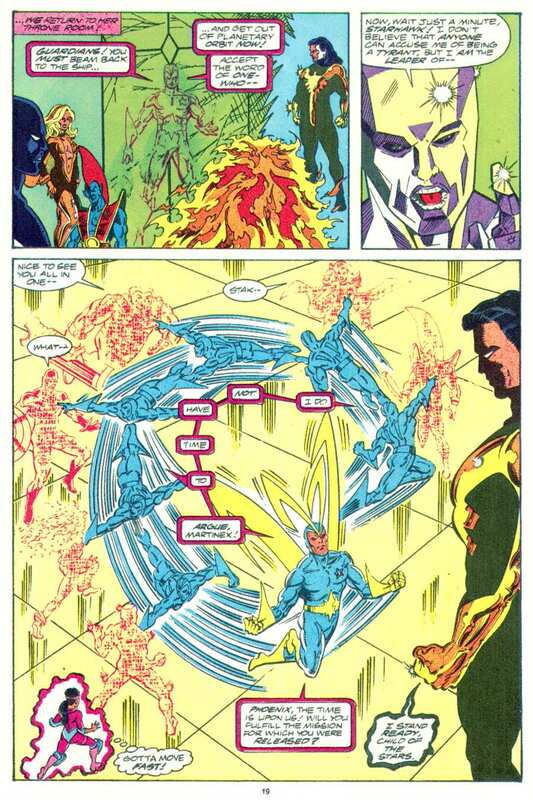 So here’s the question, with the Shi’ar owing them favour’s by this point and some characters able to teleport others (one I think can do it across interstellar space) why didn’t they just leave Earth? Here they did, not that it went any better. I liked the splitting the team idea, with a more peaceful minded team meeting with Rancor and a more combat ready team meeting the resistance, it’s a better in-story reason to split the story than the several tasks/ several locations that you normally get. It feels more like a real team with each having different skills and preferences. Once again, the art is top notch, with each character being clear and distinct in their own appearance and identity. 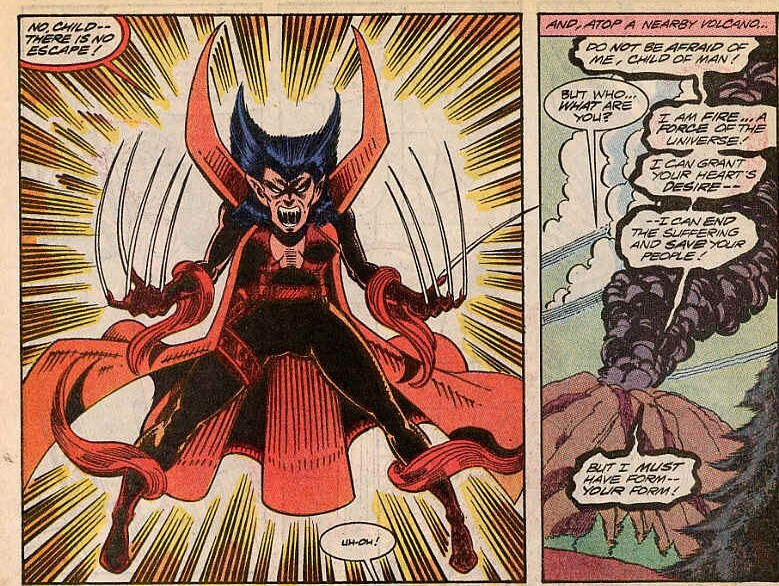 One difference between the early 90’s and what came later, can you imagine any writer killing Wolverine off now? Even after centuries, or making his descendants the villains? Charlie-27 ends the issue ready for war, with a BIG gun and next ish, the fight begins. Guardians of the Galaxy 8 was cover dated January 1991 and was on sale in November 1990, sharing the spinner racks with Books of Magic # 1, Fantastic Four #348, Green Arrow #41, Incredible Hulk #377, Robin #1 and Transformers #74. 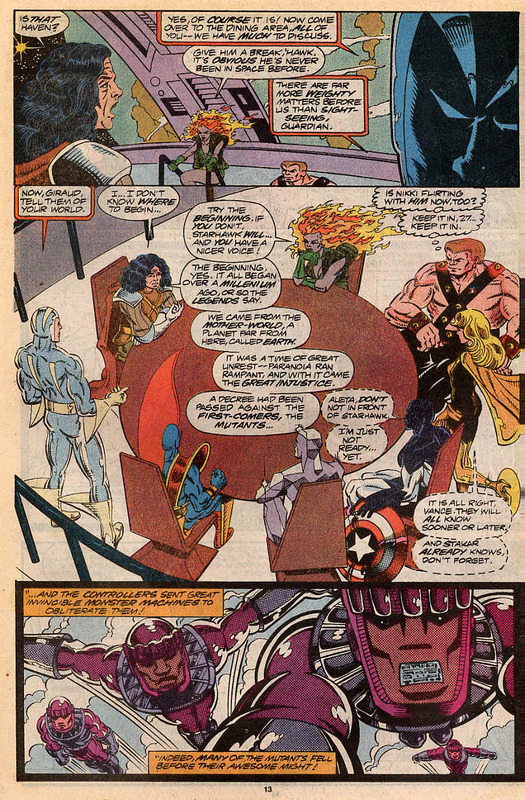 Downtime was written and drawn by Jim Valentino and inked by Steve Montano and opens up with Charlie-27, Nikki, Martinex, and Aleta training and Yondu just sort of standing there looking at his ear-ring. When his standing there holding his ear-rings is commented on, Yondu becomes enraged and demands that the team search for Force. 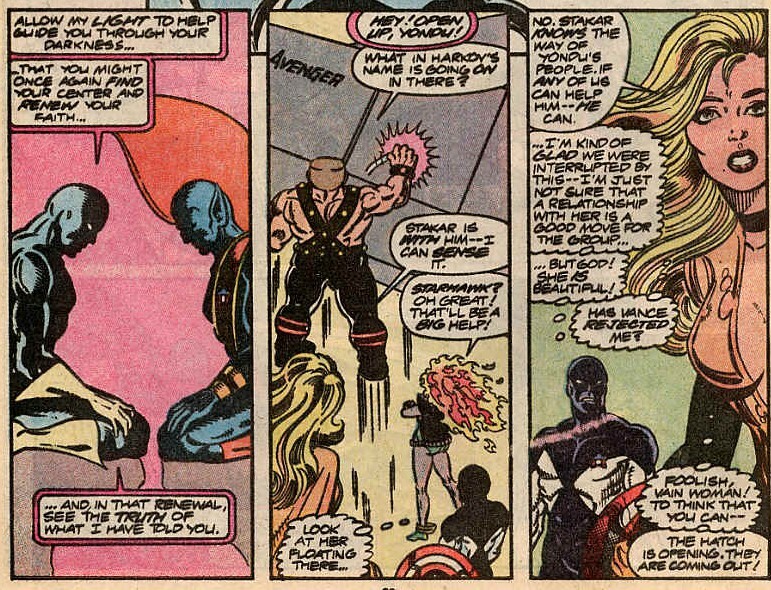 Vance Astro walks in and points out that there was no trace of Force in a 6 parsec radius and they have no idea where to begin any search for them.This sort of ends the training and the team goes to their respective quarters for some much needed downtime. In a cut away scene TSFKAT (The Stark Formally Known as Taserface) is being horrifically tortured at the order of the Stark’s High Sister. The commands that the torture end and that he be remade, his shame and anger are great and TSFKAT can be of further use. 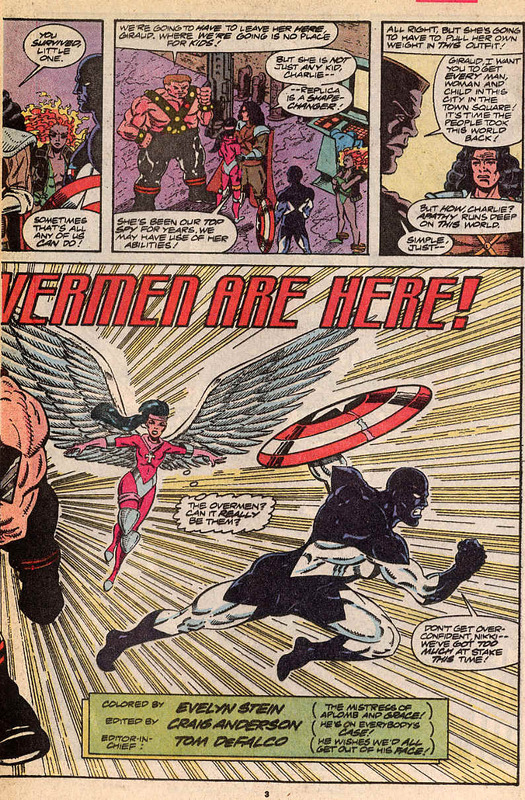 Back on the Captain America II Martinex, Vance and Aleta talk about Yondu, Aleta floating away leaving Martinex and Vance alone. 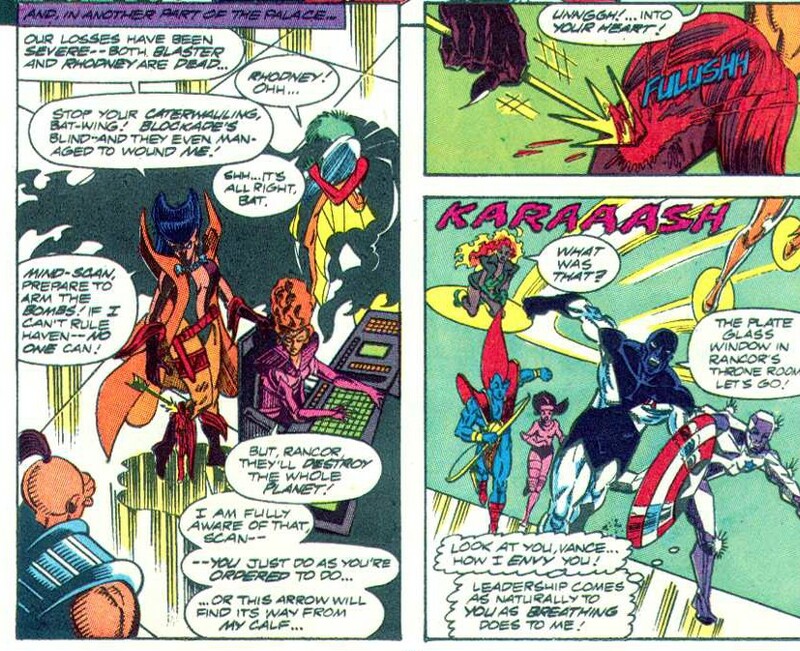 Martinex and Vance carry on talking, where Martinex mentions Vance taking over the leadership of the Guardians. Vance declines and walks into his quarters. Nikki has a bath, something she’s only done since her brief fling with Charlie-27, who walks in long enough to get a marriage proposal shot down as she walks away. Martinex works on the bridge in a freezing cold section, thinking that the Guardians of the Galaxy needs to operate on a much large scale a truly galactic group of Guardians. 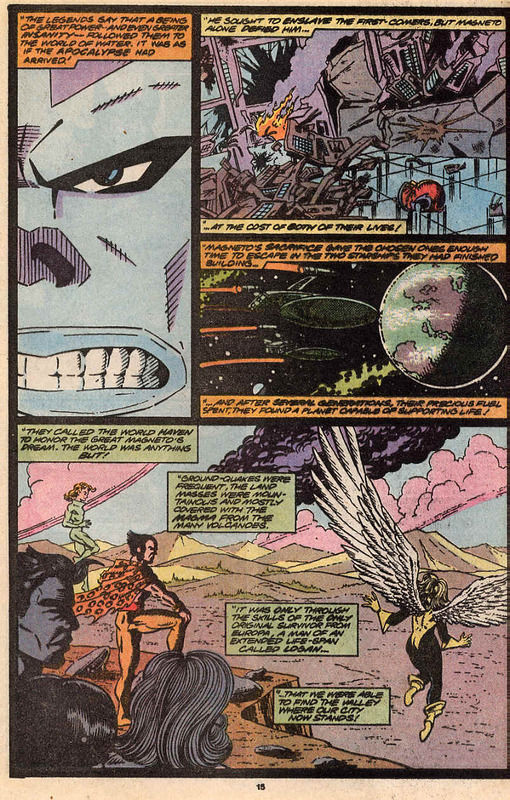 In another cut away, Starhawk sees the aftermath of a fourth massacre by the Knights of the Sacred Faith and what looks like an altar or monolith of rock surrounded by the dead bodies of non humanoid children, he muses on the events, knowing that soon the Guardians will be involved and another reference to this child. Martinex walks into Charlie and asks his opinion about Vance seeing as they are so close. Charlie points out that they aren’t, he just keeps him close to avoid being stabbed in the back. Then the ship lurches to a stop and the two race to the bridge. On the bridge Yondu demands again that they take the ship to find Photon, he is so distraught by this point that he fires an arrow at the team. Charlie orders Aleta to gag him before he can whistle, thereby changing the arrow’s direction and Charlie takes him out with a thunderous punch. Nikki comments on how hard he hits, Charlie comments on Centaurians being quite tough and needed a harder hit. 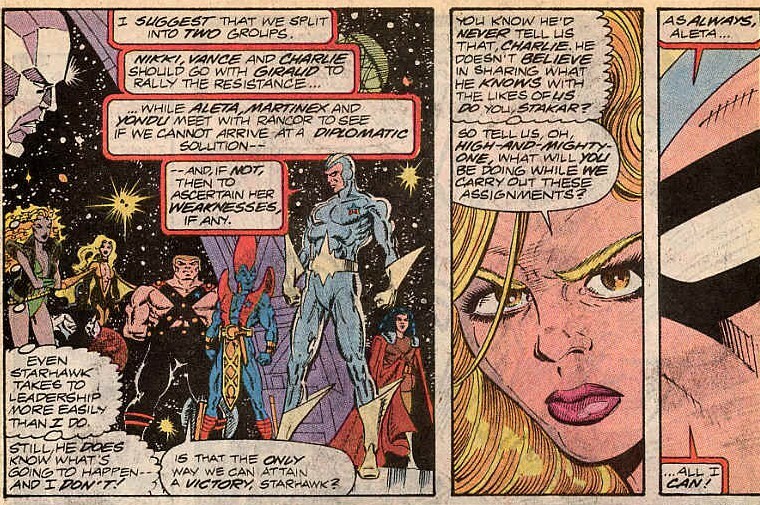 Martinex tries to talk to Aleta about her attitude to Starhawk and it goes as well as you’d expect asking a woman about the man she’s divorced from. Yondu is placed in his quarters and Vance takes a shower. After a thousand years, Vance is removed from his suit. Martinex has made his quarters have the same properties as his suit and while it’s not suitable for any other being, inside he is normal once more. As normal as a man who recreates the bedroom he had as a child. He gets into bed when Aleta walks through the wall. Here’s were we find out that Aleta is physically a solid light construct, made to look like her old self and can walk in Vance’s room as any other. She then pretty much tells him she wants him. Being an old fashioned guy he’s a bit taken aback by it all and asks if they can slow down. They hold each other for a while. In our final cut away Malevolence is advised by her father in a realm of fire, that allies are needed against the Guardians of the Galaxy if she is to the claim the child. 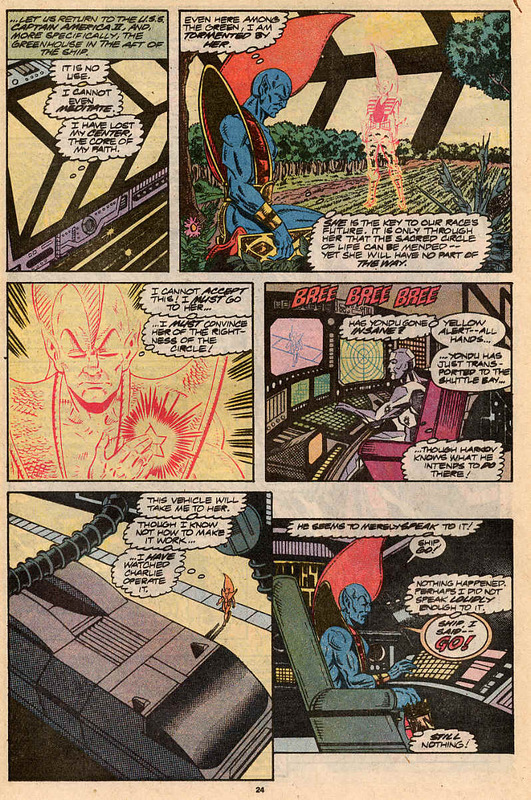 Yondu wakes in his quarters and tries to meditate, getting nowhere he decides on action and using his star-badge, teleports to the shuttle bay. He tries to get the shuttle flying, but having an aversion to technology has no idea what to do. 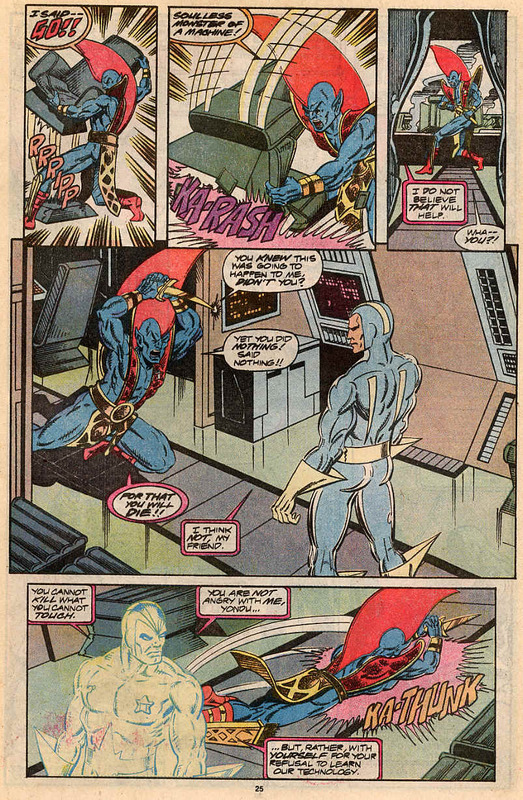 Starhawk announces his arrival and for his trouble Yondu attacks him with his knife, blaming Starhawk for not warning him about Photon. Starhawk talks him down and the two of them pray. 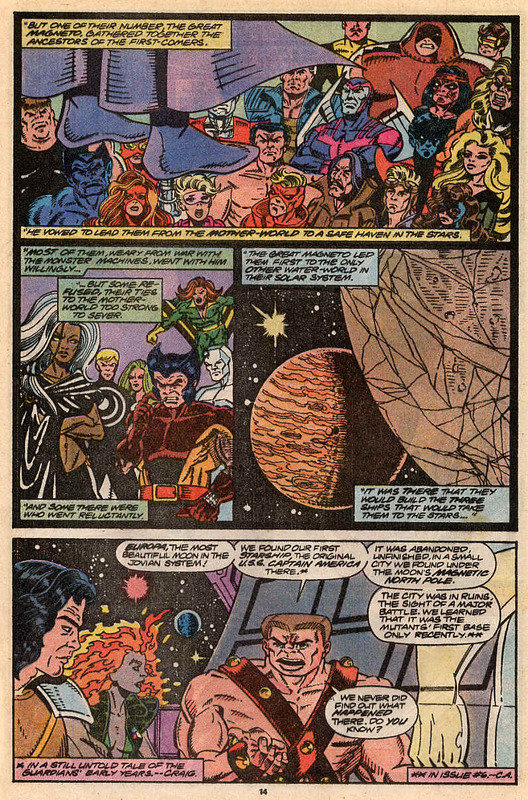 Tensions begin to grow within the group, Martinex fears for the future, but then they arrive at Haven, the world containing the last colony of man, lost before the Badoon invasion. 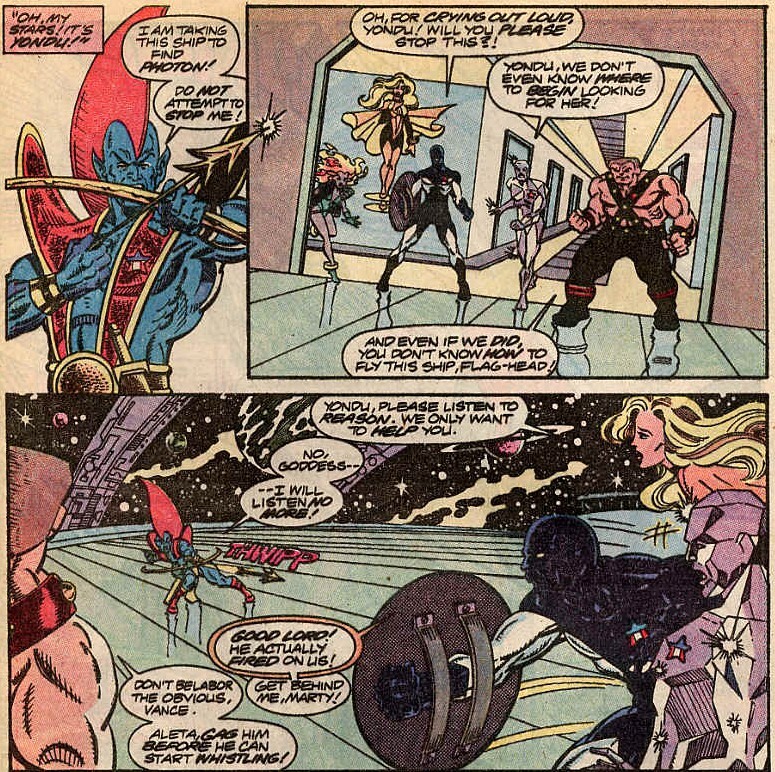 On the planet below, a telepath points out to a group of other mutants that a ship has arrived in orbit. There is then a proclamation of intent to hold onto their position by the leader of this group and the world of Haven, a mutant called Rancor. Notes: After big stories or crossover events, there is often a taking stock, character piece, where subplots are forwarded and characterisation is the issues focus, this is one of them done right. Martinex seems now to have more a character, admittedly it’s a constantly second guessing himself worrier of a character, but still it’s something. 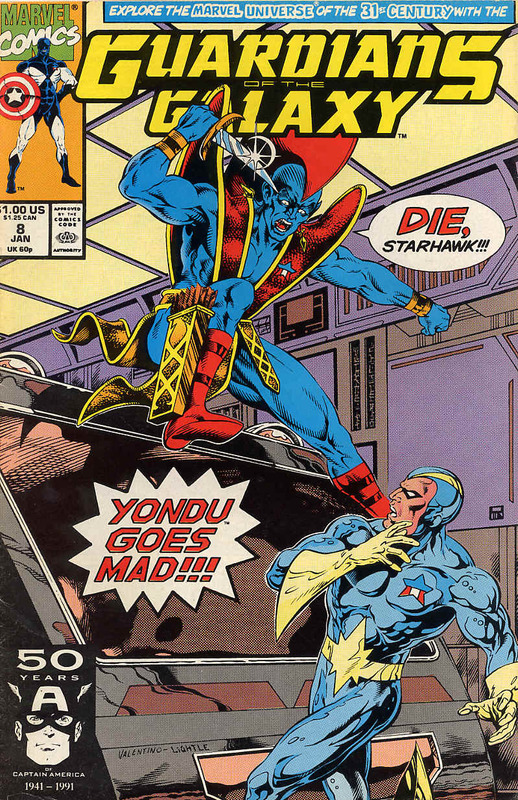 Yondu’s encounter with Photon has caused a existential/spiritual crisis that threatens a breakdown, again more character than before. Nikki and Charlie’s relationship is curtailed at this point, Charlie feeling far more for her than she does for him and the images of him in shadow are quite affecting. Vance Astro has his childhood bedroom recreated, based on what happens in New Warriors, featuring his younger self, that’s messed up. Aleta’s body is made of energy and she can walk through any wall on the ship and doesn’t seem to have told anyone? Really? 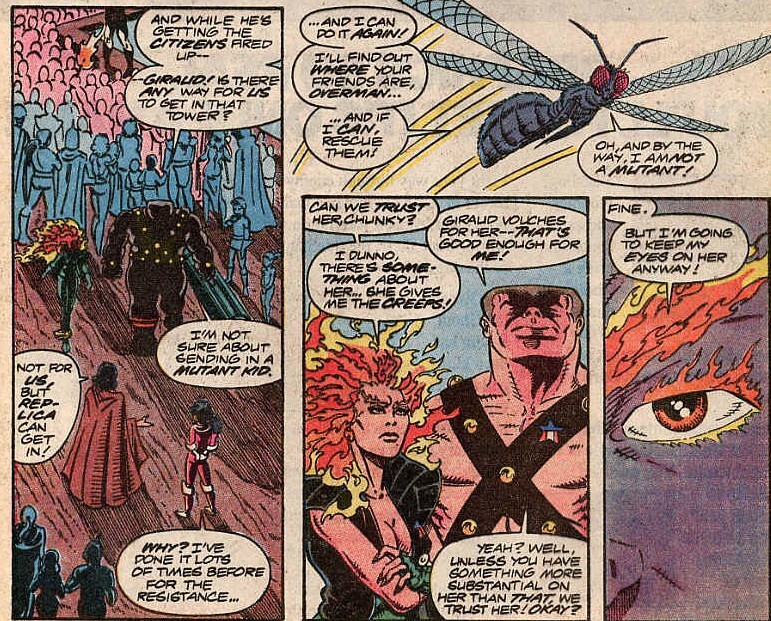 This is sort of the beginning of the Vance/Aleta relationship and one of the earlier sights of him out of costume. There’s more Malevolence in this issue, leading to more stuff happening down the road, nothing of interest, it’s just there. Haven is the colony founded by Magneto and the mutants who left Earth during the War of the Worlds and now seems to be a world run by a few tyrannical mutants, with the rest of the population believing in a saviour myth called the Overmen. The mutant leader Rancor, now who does she look like?